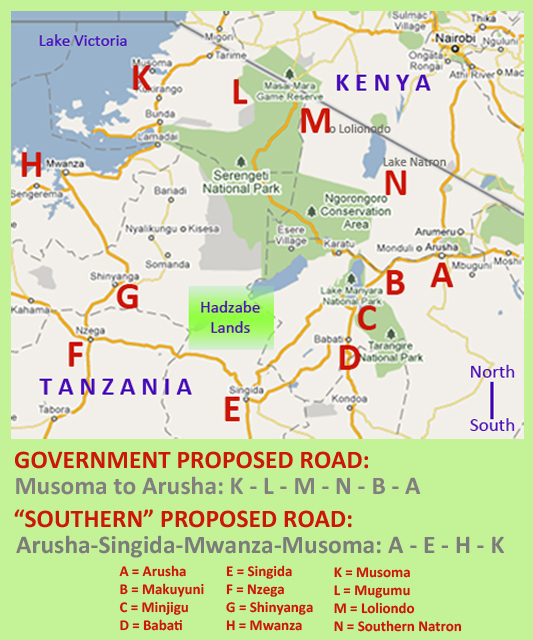 We need to stop the global MIS-information about “building” a “southern route” alternative road to the government’s trans-Serengeti commercial road in Tanzania. Work on the LAST stretch of 224 kms of this ‘alternate’ road actually started on site, 18 months ago, which is more than a year before the Save the Serengeti campaign launched its website, petitions and Facebook page. The road from MUSOMA on the lake (K) to SINGIDA (E) has been tarred since 2007. Likewise, the road from ARUSHA (A) to MINJIGU (C) in map above. The last upgrade from gravel to tar is the MINJIGU (C) to SINGIDA (E) stretch passing through BABATI (D) and this should be completed in 2012. C A N E V E R Y O N E S T O P C A L L I N G F O R A ‘S O U T H E R N’ A L T E R N A T I V E T O B E B U I L T and STOP calling for worldwide funding assistance to help Tanzania make this preferred choice? Now – can we PLEASE get down to the real business – as called for by the African Wildlife Foundation (as Phase 1 in their alternate route presentation released internationally on 16 June 2010) as also recorded in the FZS position the day before – and fight to get alternate routes OUTSIDE the park, for the development of those living adjacent the park. Frankly, I am utterly sick of the rhetoric surrounding the promotion of a southern route. It is irrelevant now – and ALL those promoters and their mis-informed “fans” and media practitioners ALL need to hang their heads in shame for completely mis-leading the world on such a sensitive environmental matter, and one that has evoked huge emotions and added to Afro-pessimism! « The great Serengeti highway: 5 options, 1 solution and 5 core value-principles needed now!